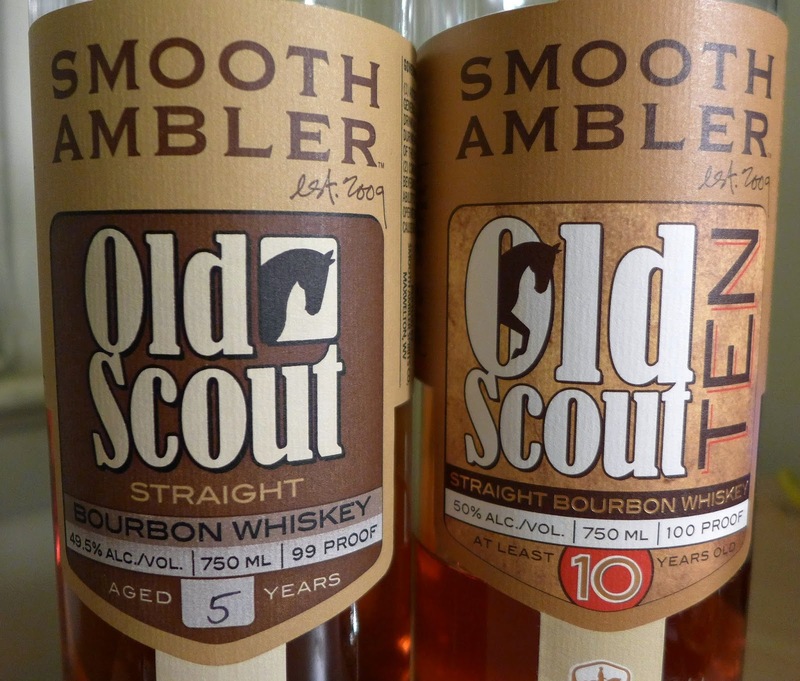 Smooth Ambler has been selling Old Scout Bourbon for a couple of years. It's Bourbon sourced from MGP/LDI and is generally available in 6 and 7 year versions. Last year a 10 year old version came out. It sports LDI's high corn 75% corn, 21% rye and 4% barley malt mash bill. 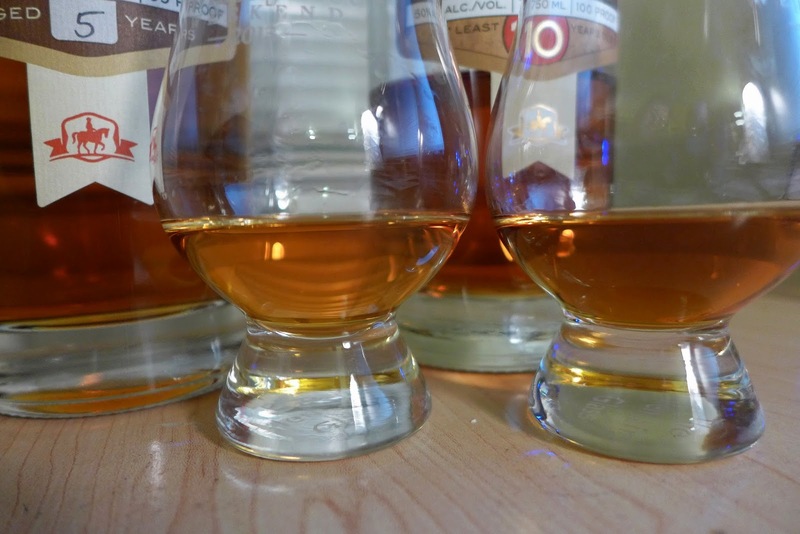 I encountered it when I volunteered to pour at the Smooth Ambler at Whisky Fest NYC. I didn't do that purely out of the goodness of my heart. I couldn't afford the ticket at the time and working the show was a way to get free admission. When the show was over I took a 1/3rd full heel bottle of the 10 year old with the idea that I'd do a head to head with the bottle of Old Scout 5 I had bought a year earlier at Park Avenue Liquor. Here it is. The younger Old Scouts have LDI/MGP's high rye mash bill with 60% corn, 36% rye, 4% barley Full disclosure - not only was this bottle of 10 year old Scout given to me by John Little, I also poured it for others at Whiskey Fest. 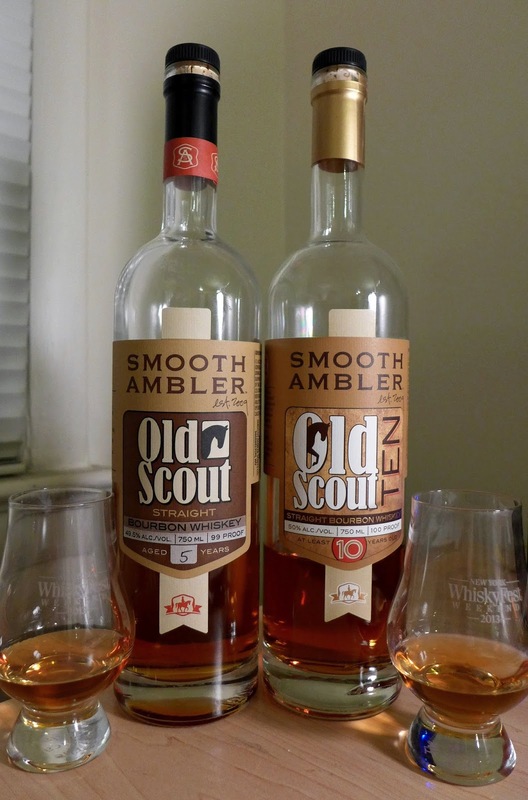 When I was doing so I described to people how John Little is distilling his own wheated Bourbon and white spirits in West Virginia but, while that matures, is also selling sourced Bourbon and rye from Lawrenceburg Indiana's LDI/MGP in a special brand "Old Scout" so that it is immediately apparent which of Smooth Ambler's whiskies are sourced. I also talked up John Little's excellent palate in selecting casks. This is particularly apparent in the VOS (Very Old Scout) bottlings, but it's clear in every sourced whiskey in the Old Scout line. John Little knows his Bourbon and rye and picks good barrels to sell. FYI - the 5, 6, or 7 year old versions of Old Scout street for around $35 in the NYC metro area. The 10 year old goes around $50. Color: medium amber with coppery glints. Nose: musky loamy earthen notes melded to floral (marigolds and lilacs) fruity (sunny peach and citrus) and rich umami protein quality with a dose of salt. There's also some darker Maillard reaction caramel notes in there underneath. Like my other encounters with Lawrenceburg Indiana bourbon I'm put in the mind of roasted peanuts, cooking peach jam and marmalade in the midst of lilacs and gardens. Palate: Sweet and honeyed on the opening with a strong attack of stonefruit compote, acetone, oak and char on the quick expansion. Vanilla floral - tangy zippy - a brief flash of mint, and then lovely oak char. This is bigger, deeper, and has more flavor amplitude than the regular Old Scout. Or so it seems. A few drops of water opens this one up beautifully. Like VOS bottlings I've tried, older Lawrenceburg, IN bourbons are swimmers and become more honeyed, vivid, and fruited with a bit of water. The nose becomes even more earthy, farm-like, and fruity-floral. The palate opens more gently and more floral. The mid-palate's citrus melds with the sweet and dark to take on an old-cognac-like rancio note. This is very nice bourbon with a drop of water. The 10 year old is a bit darker than the 5 year old. Color: light amber with golden and coppery glints. Nose: sawn oak leads, with citrus compote, floral lavender. Peanuts and violets again - but much lighter and lyrical. Palate: Sweet and floral on the opening which waxes more floral and fruity on the expansion. It's all the same flavors: vanilla floral, tangy fruity notes of the stone fruit variety. But the honeyed sweetness of the opening carries all the way through the mid-palate and into the turn to the finish. The finish, when it arrives is more about herbal bitters fading away, with a bit of oak tannins and char in the distance. Youth is an ally here: with sprightly honey, fruit and estery floral aspects dominating the darker notes that bourbon gathers with age: caramel. With a drop of water the nose becomes, if anything, more salty, solventy, and fruity. The palate become a bit more delicate, however. Lilacs, peanuts, citrus and herbs gain in vividness, but the bourbon becomes more delicate and less gutty. I'd skip the water on this one. Conclusions: The younger Old Scout has some of the charms of youth: a more fruity and floral nature. The older one has more caramel and a bit more density of flavor. They are both good and good values for the money in today's market place. Tasting them side by side I'm more struck by their similarities than their differences, given the disparity between them in age and in mash bill. They are clearly close kin. Thanks for the notes. While I still see a few 7 yr around (and have a couple in the cabinet), the 5 yr and 10 yr have disappeared in WashDC. I will miss my one remaining bottle of 10 yr (Batch 5 6/11/13 by Nikki) when it's gone, and I never had the 5. I, too, was surprised how well the 10 yr opens up with just a little water. I was also surprised at the lack of burn on the first sip (if one sips lightly, of course) for a 10 YO 100 proof spirit. It is smoother than I expected and so I still mostly drink it neat. Never tried it in a cocktail - not enough left to experiment with (smile). They 7 year old appears to be the current primary expression of Old Scout. The 5 seems to have been for the first batch only. I think the 6 and 7 are better than the 5, but only by a hair. Like so many things with whiskey (and life) you gain something in one area and give up a bit in another. The younger stuff is more floral and pretty. The older is richer and more caramel. MGP/LDI tends to fly below the radar as a distillery without its own brands. But it truly is one of America's great distilleries with a big production and a long long history. The bourbons from there have a characteristic citric acid zing that I rather like. It's good Bourbon. Not astounding "special event" Bourbon, but fine everyday sipping Bourbon and priced accordingly. Bunch of the current batch 7yr here, I have 6 bottles in my basement so you can tell I'm a fan. Josh I agree with the citric zing from these, I also get a lot of cinnamon in the nose and palate that I only get in one other bourbon, Wild Turkey 101. I was convinced for a long time OS was a vatting of WT sourced barrels blended with another one or two sourced bourbon barrels, but I know the Russel's official statement is that they don't sell any bourbon to NDP's. Either way I enjoy this 7 year batch 4 I believe. Its a bit higher than I wish at 35 a bottle here, but there are far higher priced bourbons that have nothing on old scout 7 year. Interesting tasting notes about a similarity to WT101. I'll have to look for that. I'm also going to have to try the 7 year old version (beyond just a sip at WhiskyFest last autumn)... Certainly right about the value. It's a solid pour for the money.